The title refers to the on-going air combat training conducted by naval air units out of Naval Air Station Miramar. 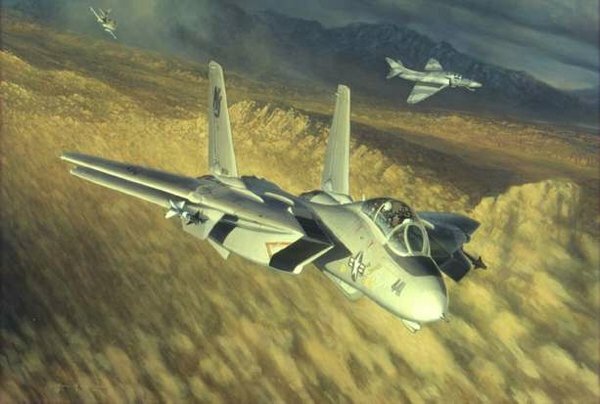 In the encounter in this painting, an F-14 from VF124, stations at Miramar Air Station is engaged at low level by two A-4s from VF126 of the Naval Fighter School, "Top Gun." The A-4, although much older than the F-14 is small and nimble. In the hands of an expert it can be used very effectively, even against the more advanced F-14. "Top Gun" is a serious competition in which pilots prove their combat-readiness by flying missions against instructors piloting A-4s to simulate enemy aircraft. The pilots flying these aircraft must be in excellent physical condition, as the range wars of the Naval Fighter Weapons School are turning, twisting melee that can span altitudes from 50 to 50,000 feet with the strain of G-forces going from plus 7 to minus 2 Gs. These rigorous drills hone the skills of fighter air crews to maximum proficiency.